It seems like fans of Arrested Development are just getting used to having to wait a very long time between seasons of the beloved show. /mystery-science-theater-3000-revival-netflix/Netflix made dreams come true when they rescued the series and brought it back for a fourth season in 2013. The revival was a massive success, and the streaming service ordered a fifth season, but progress has been slow. There is still hope though, as producer Mitch Hurwitz recently offered an update on the progress of the next season of Arrested Development. According to Variety, Hurwitz spoke about the show's status at the Netflix panel during the Television Critics Association press tour. He reportedly told the room full of journalists that the next season of the show could begin filming next year. The schedule still sounds very unsure, but Hurwitz is very invested in it. Here is what he had to say. "If it does happen, it looks like the shooting will start at the beginning of 2017. It's the thing I'm really desperate to do. We've got a lot of the stories [written] and we're ready to go. I'm so appreciative of the fans wanting more, I hate to tease them with information that there is going to be more until we know for sure, but it's what we're trying to accomplish and if does happen, it looks like shooting would be at the start of 2017. That's what I'm hoping.We're very close"
This is not at all the first that we have heard of potential shooting dates for Arrested Development Season 5. Last year around the same time, producer Brian Grazer mentioned that the fifth season would start filming in mid-2016. We just so happen to be in the middle of 2016 right now, and shooting still seems to be a long way off. But a show like Arrested Development is a very difficult thing to get done these days because the core cast is very busy and spread all over the place. It has been said that the new episodes will have connections to both Presidential candidate Donald Trump and the white-hot Netflix documentary series Making a Murderer, and will be a murder mystery revolving around Buster taking the rap for Lucille Austero's murder. Since the show was originally cancelled after its third season, pretty much the entire central cast has become very busy and very successful. Even though the desire is there for everyone to continue Arrested Development for another season, it is easier said than done. As happy as everyone was that Netflix revived the show for a fourth season, it was a bit disjointed and one of the reasons for that was having to work around the crazy schedule of the very busy cast. Another complication, which was noted by Netflix chief content officer Ted Sarandos at last year's press tour was that the series is still owned by Fox, which also makes the process a bit more difficult. 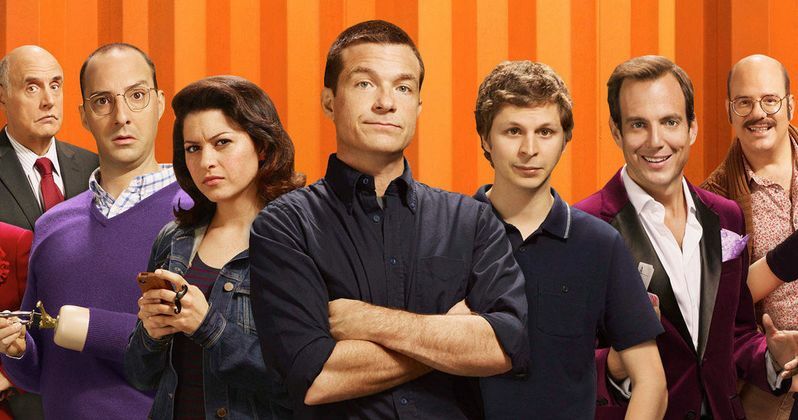 Jason Bateman, Portia de Rossi, Will Arnett, Michael Cera, Alia Shawkat, Tony Hale, David Cross, Jeffrey Tambor and Jessica Walter are all expected to reprise their roles when the show eventually does return. No update was offered on the long in-development Arrested Development movie by Hurwitz or Grazer, but they seem to be pouring their efforts into the fifth season right now. For now, you can head to Netflix and binge the four seasons of Arrested Development that currently exist. We will be sure to keep you update as more details become available.